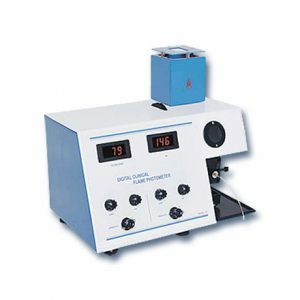 Dual Channel Flame Photometer –391/392 | Electronics India - Manufacturer, Supplier and Exporter of Analytical, Scientific Laboratory and Pharmaceautical Instruments in India. Digital Clinical Flame Photometer Model – 391 is a dual channel flame photometer used for simultaneous observation of Sodium, Potassium in blood serum (plasma), Urine & other type of biological fluids. The instruments are supplied in two units viz. Main Unit and Compressor Unit. The Main Unit comprises of digital displays, detector, filters and nebulizer. The compressor unit supplies the compressed air to the main unit. Air at a given pressure is passed into the atomiser. The suction produced by it, draws the sample solution into the nebulizer and is sprayed as fine mist into the flame. The light emitted by the element at the characteristic wavelength is isolated by the narrow band interference filters, which then falls on to the silicon photodiode. After signal conditioning of the photodiode output, it is sent to digital converter and the results are displayed directly in ppm/meq units. The narrow band interference filters are mounted on a rotating disc fitted within the Main Unit. Appropriate filter can be selected by rotating this disc with the thumb. The oil free compressor with regulator maintains a stable airflow.